SUNNYVALE, Calif.--(BUSINESS WIRE)--Flurry Analytics, part of the Yahoo Mobile Developer Suite, today announces its annual mobile and application usage study. The State of Mobile study uncovers insights around mobile app activity and trends from around the world throughout the last year, on over 2.1 billion smart devices and 3.2 trillion sessions. In 2015 overall app usage grew by 58%. 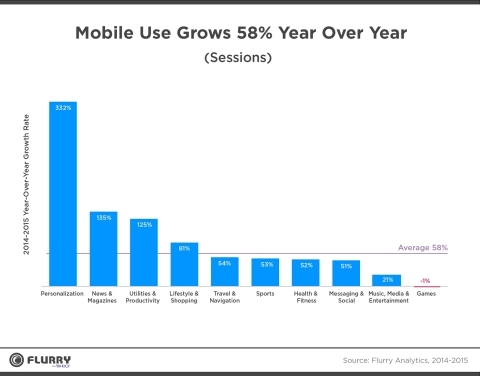 In this context, we define app usage as a user opening an app and recording what we call a “session.” With the exception of Games, every app category posted year-over-year growth with Personalization, News & Magazines and Productivity leading the way with triple-digit growth. The picture is much clearer when looking at year-over-year growth in time spent cut by form factor. Time spent on phablets grew 334% year-over-year, compared to 117% for all form factors, 2.9 times more than the average. With time spent on mobile surpassing that of television, and phablets posting astonishing growth in media consumption, it appears that the cable industry will find in the phablet and its apps its long-awaited digital nemesis. Once labeled a fad (even by us), phablets have become the unstoppable media consumption device. 27% of all new devices activated for Christmas this year were phablets and 50% of all Android devices activated in the same timeframe were phablets. In 2015, Flurry tracked a mind boggling 3.2 trillion sessions. When we started 8 years ago, we never thought that our counters could reach these numbers. On January 1st 2016, 12:01 am, the counters reset to zero and the guessing game started again. Which industry will mobile and its apps absorb in 2016? Interested in learning more about Yahoo’s developer tools and gaining insights, like this study, for your business? Be sure to check out Yahoo’s annual Mobile Developer Conference this February in San Francisco. Apply for an invite at http://ymdcsf2016.tumblr.com. Yahoo is a guide focused on making users' digital habits inspiring and entertaining. By creating highly personalized experiences for our users, we keep people connected to what matters most to them, across devices and around the world. In turn, we create value for advertisers by connecting them with the audiences that build their businesses. Yahoo is headquartered in Sunnyvale, California, and has offices located throughout the Americas, Asia Pacific (APAC) and the Europe, Middle East and Africa (EMEA) regions. For more information, visit the pressroom (pressroom.yahoo.net) or the Company's blog (yahoo.tumblr.com).